The mailman walked towards my office door, half an hour earlier than usual. He didn’t sound right. His footsteps fell more heavily, jauntily, and he whistled. A new guy. He whistled his way to my office door and then fell silent for a moment. Then he laughed. The end of the twentieth century and the dawn of the new millennium had seen something of a renaissance in the public awareness of the paranormal. Psychics, haunts, vampires–you name it. People still didn’t take them seriously, but all the things Science had promised us in filmstrips and black and white movies seen in grade school and junior high hadn’t come to pass. Disease was still a problem. Starvation was still a problem. Violence and crime and war were still problems. In spite of the advance of technology, things just hadn’t changed the way everyone had hoped and thought they would. Science, the largest religion of the twentieth century, had become somewhat tarnished by images of exploding space shuttles, crack babies, and a generation of overweight, complacent Americans who had allowed the television to raise their children. People were looking for something—I think they just didn’t know what. And even though they were once again starting to open their eyes to the world of magic and the arcane that had been with them all the while, they still thought I must be some kind of joke. My only job had been the previous week, when I’d gone down to Branson, Missouri to investigate a country singer’s possibly-haunted house. It hadn’t been. My client hadn’t been happy with that answer, and had been less happy when I suggested he lay off of any intoxicating substances and try to get some exercise and sleep, and see if that didn’t help things more than an exorcism. I’d gotten travel expenses plus an hour’s pay, and gone away feeling I had done the honest, righteous, and impractical thing. I heard later that he’d hired a shyster psychic to come in and perform a ceremony with a lot of incense and black lights. Some people. I finished up my paperback and tossed it into the ‘done’ box. There was a pile of read and discarded paperbacks in a cardboard box on one side of my desk, the spines bent and the pages mangled. I’m terribly hard on books. I was eyeing the pile of unread books, considering which to start next, given that I had no real work to do, when my phone rang. “Oh. Is this, um. 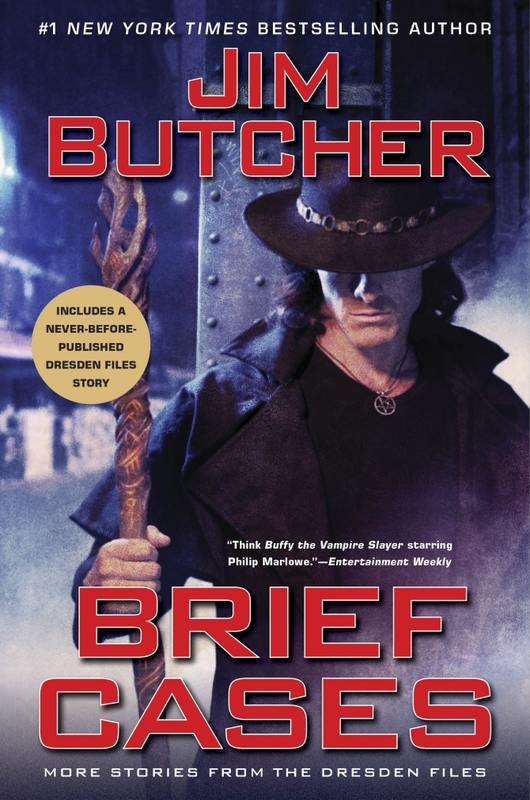 Harry Dresden? The, ah, wizard?” Her tone was apologetic, as though she were terribly afraid she would be insulting me. There was a nervous pause. “My husband,” she said. She had a voice that was a little hoarse, like a cheerleader who’d been working a long tournament, but had enough weight of years in it to place her as an adult. People who know diddly about wizards don’t like to give us their names. They’re convinced that if they give a wizard their name from their own lips that it could be used against them. To be fair, I guess I should at least acknowledge that they’re right. It must have been the no charge that did it. She agreed to come right out to the office, and told me that she would be there in an hour. That put her arriving at about two-thirty. Plenty of time to get out and get some lunch, then get back to the office to meet her. The phone rang again almost the instant I put it down. It made me jump. I peered at it. I don’t trust electronics. Anything manufactured after the forties is suspect–and doesn’t seem to have much liking for me. You name it, cars, radios, telephones, TV, VCRs–none of them seem to behave well for me. I don’t even like to use automatic pencils. I sobered immediately. Karrin Murphy was the director of Special Investigations out of downtown Chicago, a de facto appointee of the Commissioner to investigate any crimes dubbed ‘unusual’. Vampire attacks, troll mauraudings, and fairy abductions of children simply didn’t fit in the blanks on a police report very neatly–but at the same time, people got attacked, infants got stolen, property was damaged or destroyed. And someone had to look into it. In Chicago, or pretty much anywhere in the Chicagoland, that person was Karrin Murphy. I was her library of the supernatural on legs, a paid consultant for the police department. Murphy sounded bad, her voice rough and terse. Two bodies? Two deaths by means unknown? I hadn’t handled anything like that for her before. “That’s only a fifteen minute walk from my office,” I said. “I’m on the way,” I told her, already standing and pulling my jacket on. That done, I went to the stairs and started down. I rarely use the elevator, even though I’m on the fifth floor. Like I said, I don’t trust machines. They’re always breaking down on me just when I need them. Besides which. If I was someone in this town using magic to kill people two at a time, and I didn’t want to get caught, I’d make sure that I removed the only practicing wizard the police department kept on retainer. I liked my odds on the stairwell a lot better than I did in the cramped confines of the elevator.